Phil Mickelson likes them. Other players are enthusiastic and Callaway Golf (NYSE:ELY) employees are pumped up at the prospect of having a new iron, the X Forged, to help the company return to its glory days as the dominant equipment maker, a position relinquished to adidas’ (PINK:ADDYY) TaylorMade Golf. Chip Brewer, Callaway’s CEO, acknowledges they have been through some very tough times; sales in the most recent quarter were down 15% from an already low level and the quarter’s loss nearly doubled from $43 million to $84 million compared with 2011. So Brewer, Callaway number one since last spring after being hired away from the same position at Adams Golf just prior to Adams sale to TaylorMade, was at least able to report some small gains but there is no question the 2013 product line must be a hit with golfers to push the company forward. The X Forged irons are made from 1025 carbon steel and design by Callaway’s Roger Cleveland with a new groove pattern and low offsets especially liked by toursters and better amateurs. Additionally there’s a reshaped sole and the same center of gravity progression as the RAZR X Forged irons (low CG in long irons, moving higher as lofts increase). X Forged irons will be in shops on Jan. 25 for a SRP of $999.99-eight iron set steel shafts. 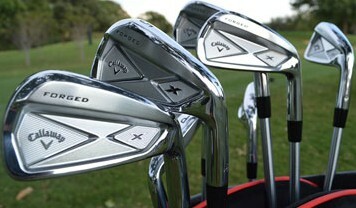 Bottom line, all of the 2013 equipment must be part of a Callaway resurgence. The company which once was the technical, design and marketing leader of the industry seemed to have lost focus under previous management who stressed many non-core products and were unable to produce clubs that resonated with consumers such as the original Big Bertha drivers. The golf equipment business needs a healthy and profitable Callaway Golf.